Made in a variety of materials to suit your application, Centryco’s Perma-Pleated Screens are the ideal choice for protection from light debris or heavy dust. The product also offers safety with eye appeal that will enhance your equipment’s professional appearance. Ideal for applications on medical equipment such as X-ray machines, inspection equipment such as coordinated measuring machines, or machine tools such as grinder and milling machines. Easy to install, the Perma-Pleated Guard is also the most economic product that you can use to provide protection to your equipment. Stock parts are available for quick delivery in a variety of sizes. Guide channels must be provided to retain your Centryco Screen covers. Allow 2mm clearance on the sides and 1mm on top. 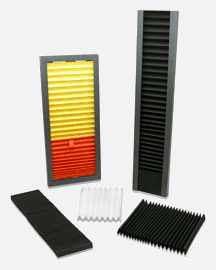 Perma Pleated Screens are available in various lengths, heights (v-depth), and up to 30″ widths. Attachment methods include Velcro (Hook/Loop), PVC or Aluminum end plates. Applications that require widths over 30″ may utilize our Sewn Screen construction method (SS) where supports are included to stabilize your cover.